Eatfindr is a free Windows 8 food app available under the ‘Food & Dining’ category of Windows 8 Store. 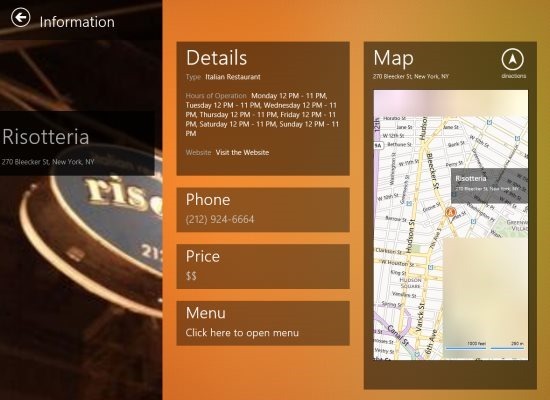 Basically, this food app for Windows 8 lets you find gluten-free restaurants available nearby your area. You can easily find the nearest and the most popular restaurants that delivers you food after considering your consciousness towards your health and dietary requirements. 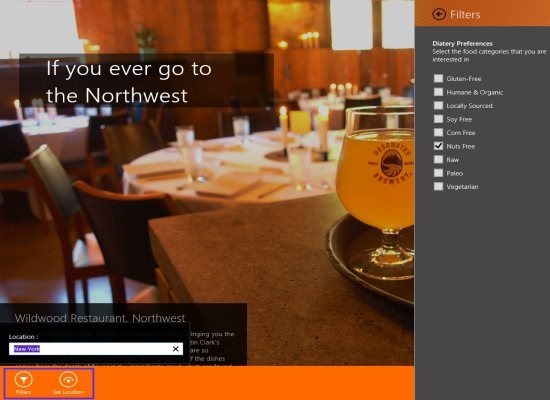 In this Windows 8 food app, you can find restaurants offering food according to your preferences such as Corn, Gluten, Soy, Nuts, and the like. You can check details about restaurants such as hours of operation, contact number, price range, map for checking directions, and other important information within the Eatfindr app. As you open the app, you will see a beautiful big HD screen where you will find food categories in tiles form such as Gluten-Free, Corn Free, Humane & Organic, Raw, Soy Free and more. You can easily filter the food preferences and select food preferences that you are interested in. By Filtering, the app will bring you the restaurants that offer food of you choice. Selecting a location for search food restaurants is very easy at Eatfinder food Windows 8 app. All you need to do is just open the app ? right-click anywhere on the screen ? this will bring a long horizontal panel at the bottom of the screen including options lick ‘Filters’, ‘Set Location’, and ‘Feedback’ ? just click on ‘Set Location’ option and enter the location where you want to know about the nearby restaurants. The featured screen will show the names of only four restaurants, but don’t worry you can check more by clicking on ‘Nearby’ button. As you click, you will get a complete list of all the nearby restaurants offering food of you interest. Now, here you need to scroll towards right to view more and more restaurants’ names. Similarly, look for restaurants in other places, as well. Bings you the nearest and the most popular food places, matching your food preferences. Comes up with restaurants that offer Gluten-Free, Corn Free, Humane & Organic, Raw, Soy Free and more.. dishes. Lest you view details of restaurants such as hours of operation, contact number, price range, map for checking directions, etc. within the app. Lets you filter the food category to make it even easier for you to find a restaurant. Head over to the store (Windows 8 Store). Press ‘Win+Q’ to get the search box. Enter the name of the app i.e ‘Eatfindr’. Soon the app will open. Click it. Now, click on ‘Install’ button to download it in system. Start searching for your favorite dietary food. 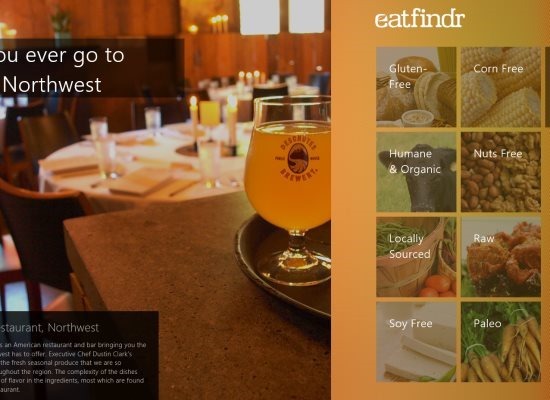 In short, Eatfindr is a good useful Windows 8 food app that helps you find the restaurants offering your food of interest such as Gluten free, soy free, corn free, and the like. Go ahead and download Eatfindr now.